I have a coolant leak between the engine block and the spacer plate to the water pump. How do I replace the gasket on the spacer plate? Hi thank you for your question hope this helps. Is this what you are calling the spacer plate? Is this it? If so this is the engine front cover / timing cover. Drain the cooling system and the oil from the crankcase. Disconnect the lower radiator hose, then remove the fan, fan clutch and shroud. Raise the van and support it with jack stands. Disconnect the fuel line from the injection manifold. 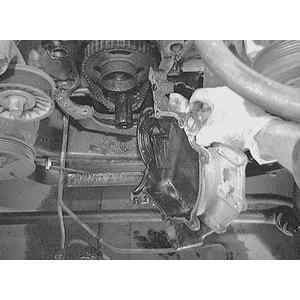 Remove the power steering pump and air conditioning compressor from their mounting brackets, if so equipped. Remove the bolts holding the fan shroud to the radiator, if so equipped. Remove the fan, spacer, pulley and drive belt(s). If necessary, disconnect the heater water hose and remove the water bypass tube. Remove the crankshaft pulley from the crankshaft damper. Remove the oil pan-to-cylinder front cover attaching bolts. Use a sharp, thin cutting blade to cut the oil pan gasket flush with the cylinder block. Remove the front cover and water pump as an assembly. Place the front seal removing tool (Ford part no. T70P–6B070–B or equivalent) into the front cover plate and over the front of the seal as shown in the illustration. Tighten the two through-bolts to force the seal puller under the seal flange, then alternately tighten the four puller bolts a half-turn at a time to pull the oil seal from the cover. Coat a new front cover oil seal with Lubriplate® or equivalent and place it onto the front oil seal alignment and installation tool (Ford part no. T70P–6B070–A or equivalent) as shown in the illustration. Place the tool and the seal onto the end of the crankshaft and push it toward the engine until the seal starts into the front cover. Place the installation screw, washer and nut onto the end of the crankshaft, then thread the screw into the crankshaft. Tighten the nut against the washer and tool to force the seal into the front cover plate. Remove the tool. Apply Lubriplate® or equivalent to the oil seal rubbing surface of the vibration damper inner hub to prevent damage to the seal. Coat the front of the crankshaft with engine oil for damper installation. 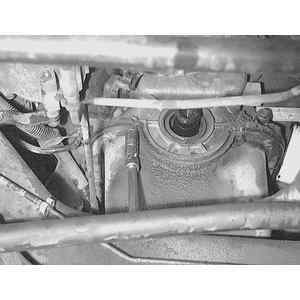 Position the gasket on the front cover, then apply silicone rubber D6AZ-19562-AA or its equivalent to the oil pan and cylinder block junction. Cut the pan gasket and position it on the front cover. Line up the damper keyway with the key on the crankshaft, then install the damper onto the crankshaft. Install the cap screw and washer and tighten the screw to 80 ft. lbs. (108 Nm). Install the crankshaft pulley. Install the fan, pulley and drive belt(s). Install the bolts holding the fan shroud to the radiator, if so equipped. Install the power steering pump and air conditioning compressor. Fill the cooling system and the crankcase with oil.